The new generation of ICT, such as Internet of Things, Cloud Computing and Big Data, enables the new network and new data environment of Innovation 2.0, makes the citizen living space and urban governance space an open mass innovation space of user innovation, open innovation, co-innovation and mass innovation ecosystem. The practice of Open Data, Wiki Government, and City as an Open Mass Innovation Space, echoes Metasynthetic Wisdom in Cyberspace which is emphasized by QIAN Xuesen, and fosters smart society. Smart city in era of Innovation 2.0 emphasizes not only application of the new generation of ICT, but more importantly sustainable people-centered social innovation in the new network and new data environment by interconnection of people, things, data, and ideas. City as an Open Mass Innovation Space (COMIS) is the new carrier of smart society based on Metasynthetic Wisdom in Cyberspace, the new approach to New Smart City, the new practice of Mass Line in era of Innovation 2.0, and new trend of "Mass Entrepreneurship and Innovation" development. The convergence and develoepment of ICT pushed forward the paradigm shift of innovation which lead to further innovation in governance. "Government 2.0: Governance in Perspective of Innovation 2.0" seminar is held at Tsinghua University from 14th to 15th November, 2014. This seminar takes Online to Offline style, and have invited e-government practitioners and researchers to discuss the governance innovation in the era of Innovation 2.0. This paper defines concept of innovation and collaborative innovation in perspectives of innovation 2.0 based on analysis of concept of innovation 2.0 and the contexts of its origins. By case analysis of evolution and development of social collaborative innovation in perspectives of innovation 2.0, the culture origins and development patterns of changes from maker to mass innovation as well as their implications are summed up. The study fills in gaps in literature that little attention has been paid to culture cultivation for mass innovation to enable social innovation and few studies have been conducted on ecosystem development for innovation. The paper has theoretical and pragmatic significance to promote sustainable development of maker movement. Related News Report "Beijing Launches New City Management App"
The 2nd Mobile Government Senimar "Innovation 2.0 in a Knowledge-based Society" is held at Peking University on 23 November 2008. The emergence and convergence of ICT enables knowledge society, dissolves the traditional boundary of science labs. The ordinary people and the users will have more say, and be a main player in the innovation process. Focus on application innovation, featuring user-centric, demand-driven, open innovation and co-innovation, Innovation 2.0 is emerging. The convergence and emergence of modern information and communication technologies opens up new horizons for organizations in a knowledge-based society. Modern ICT transcended the traditional service delivery pattern and innovation pattern by bringing personalized, localized and context aware services close to users. The traditional boundary of organization is dissolving as well as the traditional innovation and R&D boundaries. This paper conducted a preliminary comparative case study of Living Lab, Fab Lab and Application Innovation Park (AIP) based on extended technologyorganization- environment framework, and argues the emergence of innovation 2.0 as a paradigm shift from manufacturing paradigm to service paradigm in a knowledge-based society. We need to shift from manufacturing mentality to service mentality and be aware of the potentials of modern ICT on the transformation of the innovation patterns to be more cooperative, open, user-centric and service oriented. 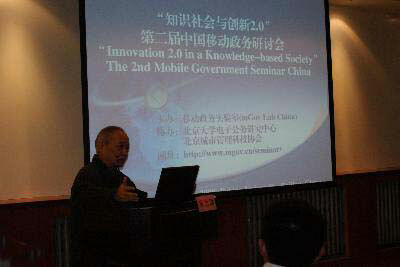 Government evolution in the era of innovation 2.0 is analyzed in perspective of paradigm shift of innovation pattern. The practice of Government 2.0 around the world is introduced. The case of city administration service map in Beijing based on innovation 2.0 is analyzed. Government 2.0, featured by user innovation, mass innovation, open innovation and co-innovation, is government as a platform, and in essence, government transforming from manufacturing paradigm to service paradigm in the era of innovation 2.0. Government 2.0, as a platform, and user-centered, service oriented, open government, creates public value through the interaction and collaboration of government, business and civil society. Download Presentation PPT Slides at "Innovation 2.0 in a Knowledge-based Society"